In most states the standard letter will suffice for registration purposes. The Letter of Good Standing is an official document that certifies your Ordination. 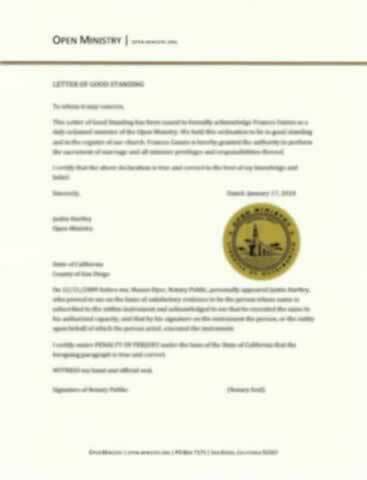 The letter is notarized with your name, ordination date and live signed by a church officer. Included is our gold embossed Ministry Seal. NOTE: Most counties require a Letter of Good Standing to register as a wedding Officiant. 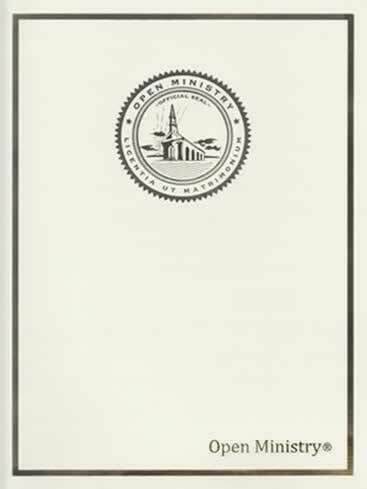 Printed on our official letterhead, this high-quality parchment has gold foil accents for special presentation of your Credentials of Ministry. Letter of Good Standing is also included in some of our packages. this was a very helpful site, easy to understand with straight forward instructions.I appreciate the many help features. Very impressed with the quality and quickness of delivery. Just signing up for free will not make you legal. You will need the ordination package to carry with you to your local county clerk's office to register as a wedding officiant. I have completed my registration for the state of VA, and I'm now ready to Wed others. You will need the letter of good standing and your ordination credential to become legal with your state, or check with them to be sure. Thank you all at Open Ministry for opening doors. I got ordained so I could perform a very special cermony for my brother and his bride. Open-Ministry was very user friendly. I would say tho, if I had known more, I would've ordered the ordination package for $19.99 instead ordering the letter of good standing and ordination cert. separately. It is important to have both and much cheaper to order the package. I became ordained recently and I was very please with the process through Open Ministry and needed the documents in my state. I have filed this letter with various counties with no issues.